Use this vanity to bring more traditional style into your bathroom. With a beige tan marble counter and brown solid wood base, this piece is very stylish. Bring a classic look and feel to your bathroom with this beautiful set from Wyndham Collection. Designed with a classic style and strong build, this vanity is a perfect choice for any bathroom. Its beautiful beige tan marble counter and black solid wood base bring a great new look into your bathroom. This set from Wyndham Collection is great for anyone looking for great style and function in their bathroom. Designed with a modern style and strong build, this vanity is a perfect choice for any bathroom. Its beige tan marble counter and brown solid wood base will look beautiful in your home. This set from Wyndham Collection is great for anyone looking for great style and function in their bathroom. Hatton 48-inch W 2-Drawer 4-Door Vanity in Brown With Marble Top in Beige Tan With Mirror Use this vanity to bring more traditional style into your bathroom. With a beige tan marble counter and brown solid wood base, this piece is very stylish. Bring a classic look and feel to your bathroom with this beautiful set from Wyndham Collection. 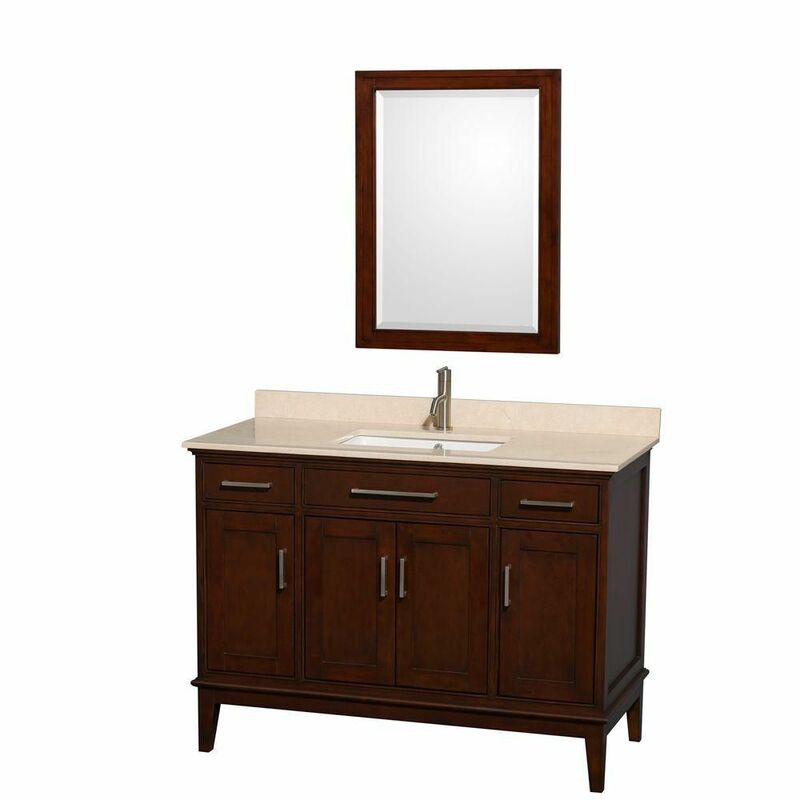 Hatton 48-inch W 2-Drawer 4-Door Vanity in Brown With Marble Top in Beige Tan With Mirror is rated 5.0 out of 5 by 1. Rated 5 out of 5 by happy from best purchase ever I love this bathroom vanity. The dark chestnut wood is very rich looking. The quality is good not particle board. The drawers glide nicely and don't slam shut. Very satisfied. I also purchased the matching linen closet that is beautiful also.